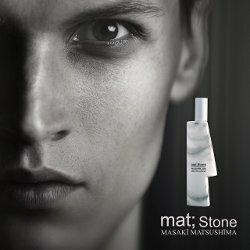 Japanese designer Masaki Matsushima has launched Mat; Stone, a new fragrance for men. Mat; Stone was inspired by the feel of white marble. The notes include lime, angelica, cardamom, violet leaf, mineral musk and cashmere woods. Masaki Matsushima Mat; Stone is available in 40 and 80 ml. I canNOT believe they didn’t hire Matt Stone as the face for the fragrance. Talk about a missed opportunity.